Dyson DC16 Animal | What Car? A three-hour charge gives six minutes of use. While that's not long to get round an entire car, the cleaner is particularly powerful, and, when used in conjunction with the nozzle attachments, it cut through even the toughest grime we could find. No other cleaner we tested matched its suction power. Clever design is as much a part of a Dyson product as the way it works, and the Animal is no exception. Everything clicks into place simply, and it is operated by a one-touch on/off button. Likewise, the dust collection box drops off with the push of a button, ensuring you'll never get your hands dirty emptying it. The Animal is eye-wateringly expensive if you are only going to use it as a car cleaner. However, as its name implies, it has been designed for use anywhere your animals go, and there's no doubting its superb abilities to clean up after them. Lifetime filters help keep running costs down, while reasonable discounts are available if you shop online. Like all Dyson products, this cleaner looks like it could be a spare part from the Tardis. We like that look, although it won't appeal to everyone. The product is sturdy, practical and the various pieces link together well. A two-year guarantee gives you piece of mind. 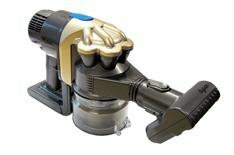 While there isn't a vast array of nozzle attachments, they do the job that other cleaners need two or three tools to achieve.